Summary: Cilantro has many health benefits, and new studies now show that cilantro may chelate heavy metals from the body. (NaturalNews) There are many good reasons to add more cilantro, also called coriander or Chinese parsley, to our diets. This aromatic green herb, which is popular in Mexican cuisine, is bursting with vitamins, minerals, antioxidants and phytonutrients. It is also a proven antiseptic, antifungal and anti-inflammatory, and long-term consumption of it has been known to treat digestive disorders, fatigue, heart disease and autoimmune conditions such as rheumatoid arthritis. Cilantro is, in short, far more than just a flavorsome garnish. However, cilantro possesses another health benefit of which most people are unaware: it is effective at chelating numerous heavy metals from the body. This is a huge plus in a world in which a growing number of foods and dietary supplements are contaminated, resulting in widespread heavy metal toxicity. In 2001, researchers in Japan decided to investigate the effects of cilantro on lead deposition. 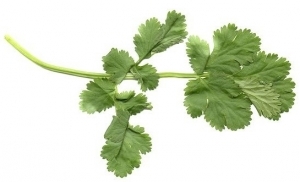 For their study, which was published in the Journal of Ethnopharmacology, the researchers administered cilantro via gastric intubation to male mice suffering from high levels of lead in their bodies. An established chelating agent, dimercaptosuccinic acid (DMSA), was used as the control. After the 25-day trial period, the mice were checked for lead. The results showed that both the cilantro and the DMSA had "significantly decreased lead deposition in the femur and severe lead-induced injury in the kidneys." Moreover, the cilantro increased the urinary excretion of delta-aminolevulinic acid (ALA), which is known to increase with lead intake. The researchers concluded that cilantro contained substances that had a suppressive effect on lead deposition. Another study published in Acupuncture & Electrotherapeutics Research found that cilantro could help chelate mercury and aluminum, as well as lead, from the body. However, this result was discovered by accident. Yoshiaki Omura, a doctor and the director of Medical Research at the Heart Disease Foundation in New York, kept finding that antibiotics were ineffective at treating certain eye infections. Even when the infections appeared to have completely subsided, they would return a few months later. Upon closer investigation, Dr. Omura learned that the organisms causing the infections appeared to hide in parts of the body that had large concentrations of heavy metals. It was almost as if the organisms were using the metals to protect themselves from the antibiotics. Since heavy metals are excreted in the urine, Dr. Omura began testing his patients' urine. When one patient exhibited increased levels of mercury in his urine after consuming a meal containing cilantro, the doctor began to test the herb for its possible chelating properties. He found that the cilantro accelerated the removal of the heavy metals from his patients' bodies, allowing the antibiotics to eliminate the infections for good. To use cilantro for its chelating properties, consume a quarter cup of its leaves and stems per day. It's a good idea to avoid exceeding this amount during the first two weeks, since you'll risk releasing more heavy metals than your body can efficiently remove. Once the initial deposits are cleared, however, you can increase this amount. You could even combine the cilantro with other chelating foods, such as spirulina and chlorella, for a more potent detox.